Fluffy sand and mild waves lapping the shore of Seven-Mile Beach make Grand Cayman an ideal playground for kids. When they become exhausted from too much sun and sandcastles, we’ve found six activities you can enjoy with them, each offering a glimpse of Cayman culture. Did you know that a large portion of sand is poop from the Parrot Fish or that the endangered Blue Iguana lives only on Grand Cayman Island? These and other fascinating facts about nature are explored in hands-on eco-experiences offered by the Ritz Carlton Hotel. 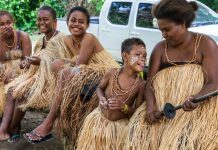 The entire island becomes a natural classroom for this fun, educational program based on the Oceans Future Society founded by Jean-Michel Cousteau, the ocean environmental advocate, educator, filmmaker and son of sea explorer Jacques Cousteau. Naturalists with degrees in science and/or education teach the curriculum with four underlying principles: everything is connected; biodiversity is good; there is no waste in nature and everything runs on energy. Kids 4-9 years old learn about local critters and flora and fauna through field trips, scavenger hunts and crafts and games. 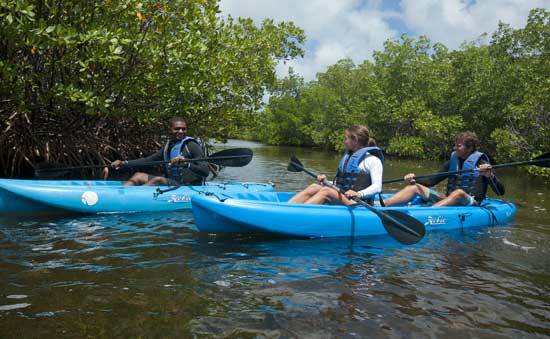 Older kids and adults enjoy ocean exploration like snorkeling and photographing the undersea world and kayaking through the mangroves at sunset. Classroom courses are taught in a cottage on the hotel grounds, a replica of a typical Caymanian home. This one is completely green, showing that the Ambassadors practice what they preach. Their program is the most wonderful way to learn about and appreciate the delicate ecosystems of the ocean world, especially for kids living in landlocked areas. Ambassadors of the Environment is open to anyone, not just guests of the hotel. Who are the people of Cayman, where did they come from and why do they drive on the left side of the road? The answers to these questions and much more are found at the National Museum housed in one of the oldest building on the island in Georgetown. Children will get the big picture through a 15-minute introductory video explaining the history and culture of the three Cayman Islands from their beginnings up to present time. The next room—National History Gallery—shows the natural world of the islands. Kids will love the submarine booth where they can dive deep into the ocean and view marine life by pushing buttons. Upstairs, the Children’s Gallery invites very young children to touch and play. Older kids will be fascinated by the lifelike Cayman fisherman as he talks about living on the sea in an authentic catboat in the Cultural History Gallery. And they can peek inside a real jail to see what it would have been like to live like a prisoner within the rock walls of a small space. New exhibits are added every month in the Changing Gallery. Visiting the museum at the beginning of your visit so you can better appreciate the country and its people. 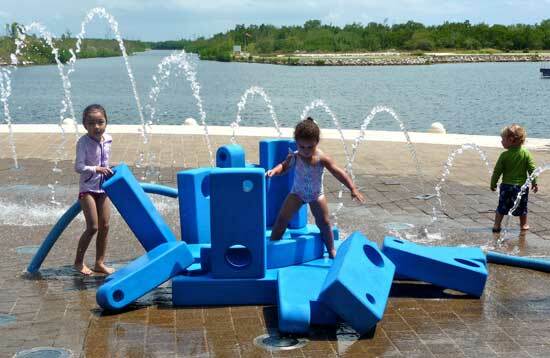 Kids have a natural attraction to water, especially when it shoots up in a 30-foot stream, then recedes to a puddle as it does in the dancing water fountains at Camana Bay. Local moms bring their kids here to cool off and play for hours. If you are looking for a change of pace from touristy downtown Georgetown, this upscale mixed-use community offers a great laid-back option. On Wednesday and Saturday morning, Books & Books book store hosts story time with sing-alongs and crafts. Bring a change of clothes for the kids so you can stay for lunch at one of the great restaurants. Or buy a to-go meal at the gourmet food store, Bay Market, and spread out a picnic on the lawn of The Crescent where the kiddos can chase a resident chicken or search for illusive iguanas. Explore the underwater world around Grand Cayman without getting wet! The Atlantis Submarine is the perfect vehicle for experiencing the deep sea like divers do. The 65-foot vessel goes 100 feet below the surface, giving passengers a closeup view of the sea life of Cayman Islands National Marine Park. Large portholes on both sides of the boat get you up close and personal with the creatures of the ocean while guides tell you what you are seeing. It’s an educational as well as fun experience for kids and adults, much better than an aquarium when you realize you are actually in the ocean. The air-conditioned cabin is six feet high and can accommodate 48 people on back-to-back seats. It’s a little tight, but when you look out into the vast underwater world, any signs of claustrophobia disappear during the 90-minute tour. Children four and older and three feet tall are allowed, but be sure to have them make a potty stop before you board as the ship has no bathrooms. Caymanian legend says that long before residents and tourists, pirates hid out on the islands along with shipwrecked survivors and slaves. One local tells of how her father found gold coins buried in the sand. But at the National Museum, no trace of pirate paraphernalia is on display or even mentioned. Their explanation: “We have not found any physical evidence of pirates on the island.” Still, Pirates Week is a much-heralded 11-day celebration on Grand Cayman the first week of November. With popularity of Pirates of the Caribbean and kids’ fascination with the swashbuckling bandits, it’s natural for Cayman to promote the legend with tours and attractions to get kids in touch with their inner pirate. 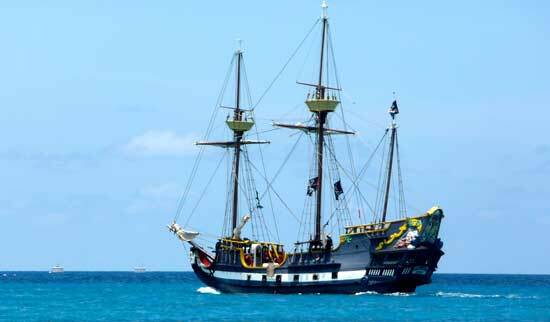 One such tour is Pirates of the Caymans, a “pirate ship” that sails along the coast of Seven Mile Beach. With a crew dressed as pirates entertaining passengers with pirate pastimes like sword fights and plank-walking, it’s a good old-fashioned family fun time on the beautiful Caribbean Sea. Another pirate-themed activity is The Pirate’s Caves. Though the caves (where pirates hid treasures. . .or not) are a small part of this attraction, it’s an interesting place to visit for its nature park, animal sanctuary and more than 30 breeds of exotic birds and reptiles. It’s part botanical garden and part zoo, and the kids will enjoy walking the paths to see what island critter they can discover next. We didn’t go into the caves, but if there was gold hidden, you can be sure it’s long gone. Author Bio: Award-winning journalist Claudia Carbone is based in Denver and travels often to the Cayman Islands.